I’m not very fond of the store-bought version of sweet chilli sauces. Sauces like that tend to be full of preservatives and thickening agents. Worst of all though, they don’t even taste that nice: sweet to the point of being cloying and not at all spicy. 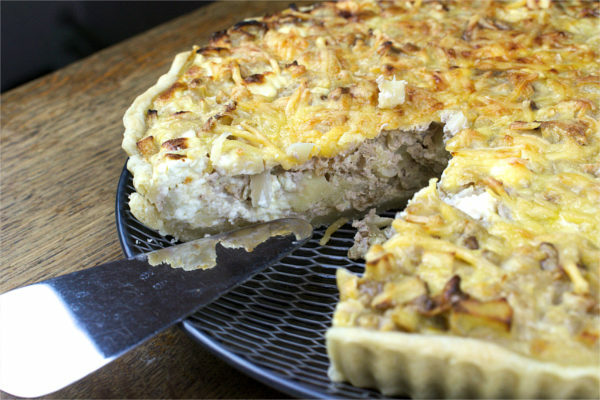 Surely, any home-made version couldn’t be worse? We’re probably all guilty of buying items at the grocery store that we didn’t intend to buy. Stuff that we don’t even really need. For some people those buys come in the form of a pack of cookies. In my case that buy took the form of a bag of fresh red chilli peppers. 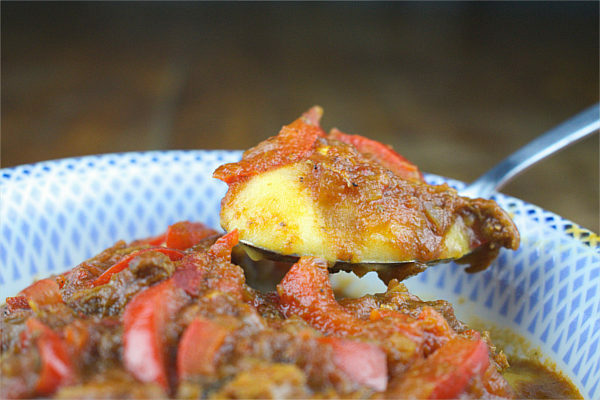 I like cooking with fresh chillies and use them in a load of different dishes. But even then I knew I couldn’t use them all up before they spoiled. So the search began for a recipe that would take a fair amount of chillies. 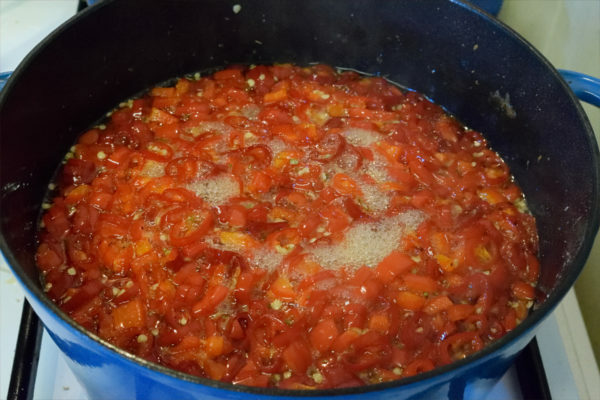 A sauce seemed a good place to start and that’s how I ended up making sweet chilli sauce. 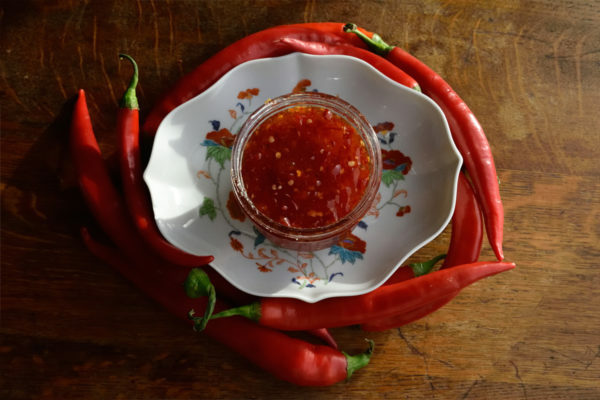 Sweet chilli sauce is originally called nam chim kai and it originates from Thailand. It’s used as a dipping sauce or as a base for other sauces. I’ve never been to Thailand, so I don’t know if the original sauce is anything like the sweet chilli sauces I can buy at my local supermarket. But I suspect it isn’t. Because I don’t have first-hand knowledge of Thai sweet chilli sauce, I simply set out to make a batch of tasty sauce. First thing I wanted to achieve was a sweet sauce that wasn’t cloyingly sweet. By adding a good amount of vinegar I got a sauce that is both sweet and sour. Second thing to make changes to was the amount of spice. Of course I started with red chillies. But I needed so much peppers to get enough bulk that I feared my sauce would become far too hot. Not that I mind hot chilli sauces but I wanted something that would be a bit more versatile. Adding a bell pepper to create volume turned out to be a good solution. As a finishing touch I added a bit of garlic and oregano. Unopened this sauce will keep in the fridge for a very long time. So far none of the sauce I made has spoiled, so I don’t know exactly how long it keeps. But several months at least. 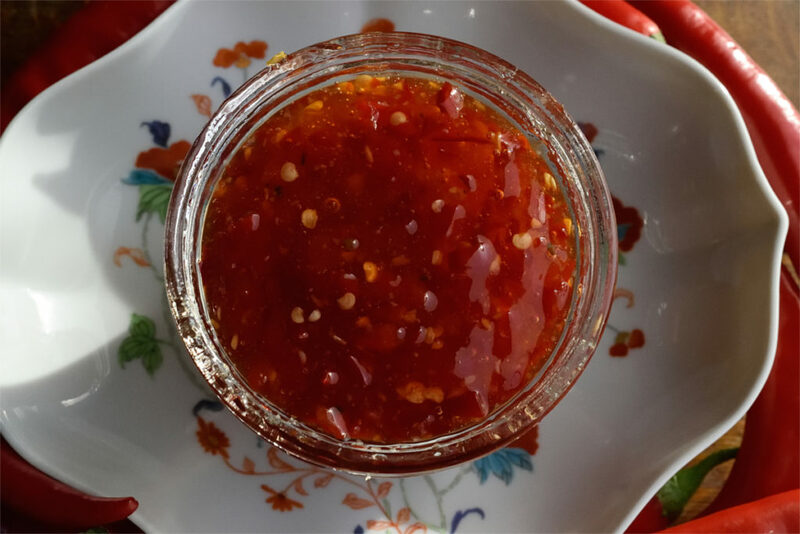 This sweet chilli sauce is very easy to make, mildly hot and both sweet and sour. 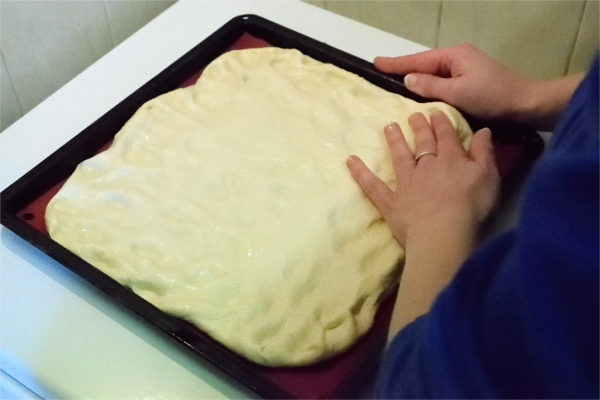 You'll never want the store-bought version again! 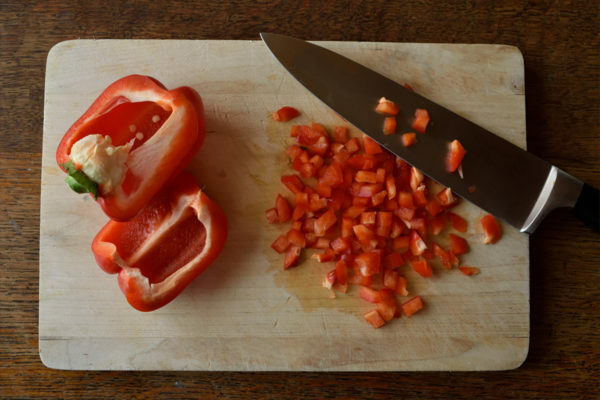 Deseed and finely chop the bell pepper. 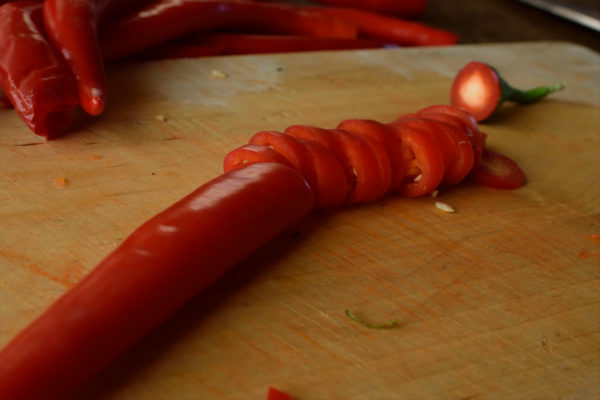 Remove the stalks from the chillies and cut them into slices. Weigh the bell pepper and chillies together. The total weigh should be about 500gr. Combine all the ingredients in a pan and bring to a boil. Let the mixture simmer while stirring occasionally. Don't let your sauce simmer for much longer then 2 minutes. Otherwise your sauce will be more like a jam. Which is also tasty, but not what we're aiming for. When you're happy with the consistency of your sauce remove the pan from the heat. Pour the sauce into your prepared jars and put on the lids. 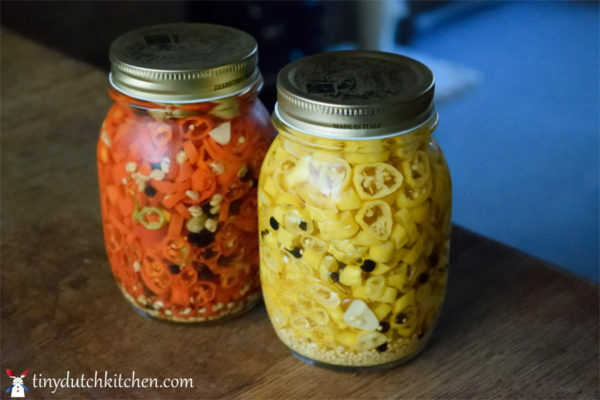 Let the jars cool a little bit before turning them upside-down. Then leave them to cool down completely. Letting your jars cool while upside-down, should create a vacuum. If one of your jars turns out not to be completely vacuum (there always seems to be one), simply use this one up first.